The People’s Progressive Party Civic (PPPC) was not invoiced for more than GYD$22 million in political advertisements for the 2011 and 2015 general elections on the state-owned National Communications Network (NCN), according to a forensic audit report released Friday by the Finance Ministry. That figure includes almost $13 million in ads that were played free of cost for the 2011 campaign under the guise of Public Service Announcements (PSAs), the report states. On the other hand, the auditor found that A Partnership for National Unity (APNU) owes GYD$45,000 for political advertisements for the 2011 general elections and GYD$20,000 for the 2015 polls. 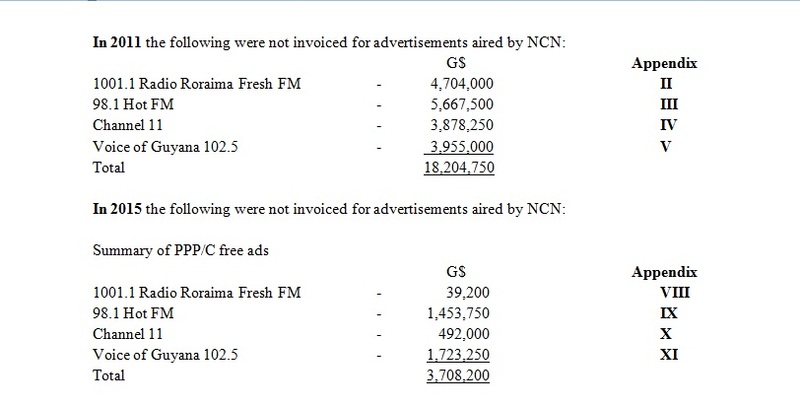 Details show that in 2011, NCN did not invoice the PPPC for $18,204,750 and the APNU for GYD$45,000 worth of advertisements aired by the radio and television broadcaster. The report states that included in the PPP/C amount for 2011 is $12,988,500 in advertisements which were recorded as PSAs. “NCN could not present a documented policy on PSAs. However we understand that political advertisements is not approved as PSAs,” the auditor remarked. The auditor further states that there was no evidence that NCN made any effort to collect a balance of GYD$17,317,686 owed by Impressions for campaign ads placed for the Peoples Progressive Party for the 2011 Regional and General Elections. While the Finance Manager advised that letters were sent by the Debt Recovery Department on 10 November 2011, 13 December 2011 and 29 November 2013, however actual copies of these letters were not available for examination. There is no evidence that legal action was initiated to recover this debt from the customer. On the 16 April 2015 the Chief Executive Officer (Molly Hassan) wrote a memo to the Board of Directors to have the amount written off as uncollectable in keeping with the laws of Guyana. However, the auditor states that there is no evidence that the then Chief Executive Officer, Molly Hassan sought legal advice from the Company’s then lawyer, Ms. Jaya Manickchand.